Tonight I'm smoking an Eriksen freehand straight grain (pictured here). I haven't smoked it in awhile - at least six months - and thought it was time to bring it back into the rotation. I'm enjoying a bowl of Frog Morton, which is a delightful English/Balkan blend with just the right amount of Latakia. A straight grain pipe is characterized by the grain of the bowl, the pattern of which is straight up and down (or relatively so), from the bottom of the bowl to the top. It is just this aesthetic that makes straight grain pipes so desirable. Typically, a straight grain pipe will have equally attractive birdseye on the top and bottom edges of the bowl. The birdseye is the grain of the wood seen edge-on, and usually create very distinct whorled patterns. Does a straight grain pipe smoke better than a pipe which is not so well-endowed? This is always a debatable issue, but it's been my experience that they smoke the same. In fact, it can be argued that a pipe in which the birdseye is on the inside and outside of the bowl, rather than the top and bottom as in a straight grain pipe, provides the better smoke. The reasoning is that the birdseye, which is essentially the "pores" of the wood, carry the heat and moisture away from the bowl, offering a cooler, dryer smoke. My guess is that any advantage is negligible at best. 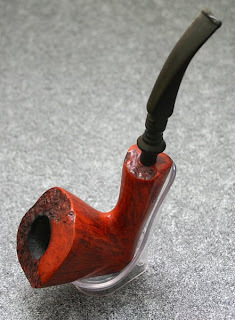 Typically, straight grain pipes are more expensive because the source briar is relatively rare. It's not often that a pipe carver discovers a piece of briar that will yield a straight grain, which drives the price up due to its scarcity. I only have a couple in my collection, but there is something just a little more satisfying when smoking a pipe that is especially beautiful and rarer than most. The quality of the smoke is the same as similar quality pipes, but there is an intangible quality that is difficult to describe. In the end though, at least for me, it is the smoking quality that really determines how well I like a pipe. The Eriksen has always been a good smoker for me, so the straight grain on it is just the frosting on an already good cake.